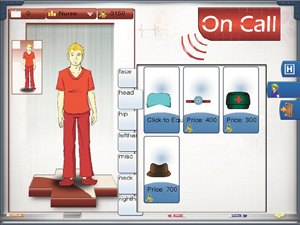 On Call is a Serious Game that allows medical and nursing students to simulate patient assessment in Emergency Department (please find also Crossing the Chasm With Serious Games For Medical Education). Developed by the University of Massachusetts Medical School, Becker College, and the Massachusetts Digital Games Institute, On Call was voted Best in Show at the Serious Games and Virtual Environments Showcase at the 13th Annual International Meeting on Simulation in Healthcare (IMSH), held January 26–30, 2013 at The Peabody Orlando Hotel in Orlando, FL. The multiplayer Serious Game simulates an Emergency Department and is designed to sharpen quick-thinking skills for emergency medical personnel. 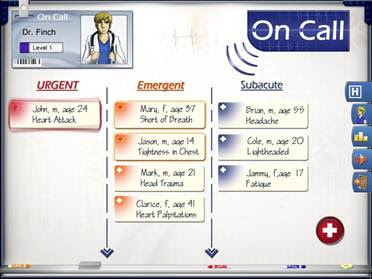 On Call allows students to use social network-style game mechanics to play different medical team roles in a fast-paced setting. Students have the opportunity to assess, evaluate, and treat patients while balancing factors such as time, efficiency, and resources. In a statement, MassDiGI executive director Timothy Loew added that “On Call” was built by students from Becker College, Worcester Polytechnic Institute, Rensselaer Polytechnic Institute, Springfield College, Mt. Holyoke College, and Berklee College of Music, with support from UMMS experts and game industry professionals during MassDiGI’s 2012 Summer Innovation Program at Becker College in Worcester. “On Call game will enter a closed beta testing period next semester. After more testing, the developers look to commercialize the game”, Loew said. WORCESTER, MA -- A game developed by UMass Medical School (UMMS), the Massachusetts Digital Games Institute (MassDiGI), and Becker College was voted Best in Show at the Serious Games and Virtual Environments Showcase at the 2013 SSIH International Meeting for Simulation in Healthcare in Orlando, Fla., on Tuesday. “We are very excited, pleased and proud to have received this recognition,” said Michele Pugnaire, MD, UMMS senior associate dean for educational affairs and professor of family medicine & community health. The inter professional Center for Experiential Learning and Simulation (iCELS) at UMMS played a key role in the game’s development. The training, communication, and assessment game, titled “On Call,” simulates an Emergency Department and is designed to be played by medical and nursing students. The multiplayer, asynchronous game allows students to use social or Facebook-style game mechanics to play different medical team roles in a fast-paced setting. Students have an opportunity to “virtually” assess, evaluate, and treat patients while balancing factors such as time, efficiency, and resources. “By combining gaming technology with medical education, ‘On Call’ represents a special opportunity for innovation in simulation,” said Melinda Taylor, senior engineer in simulation at UMMS. “On Call” was built by students from Becker College, Worcester Polytechnic Institute, Rensselaer Polytechnic Institute, Springfield College, Mt. Holyoke College, and Berklee College of Music, with support from UMMS experts and game industry professionals during MassDiGI’s 2012 Summer Innovation Program at Becker College in Worcester, according to MassDiGI Executive Director Timothy Loew. Loew said the “On Call” game will enter a closed beta testing period next semester, allowing for further data to be gathered. With data in hand, the partners plan to continue the development and commercialization process. “Building ‘On Call’ was a great experience for me and everyone on our team,” said Cordell Zebrose, a Worcester Polytechnic Institute student who worked on the game. “As we know from our experiences and outcomes at UMMS, simulation technologies are having a positive impact across the healthcare professions on many levels. 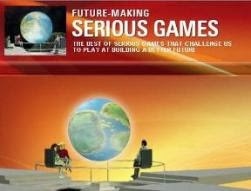 And, in the case of serious games like ‘On Call,’ we are eager to explore new opportunities,” said Dr. Pugnaire. The Princeton Review ranks Becker College as one of the best 377 colleges in the U.S. and Becker’s undergraduate video game design program as one of the top two in Massachusetts and top 10 nationwide. 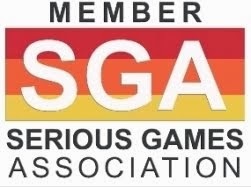 In 2011, Becker was designated by the Patrick-Murray administration as host of the Massachusetts Digital Games Institute (MassDiGI). Becker serves 1,800 students from across the country and around the world and offers a wide range of quality degree programs that launch careers, from nursing to veterinary science, and a variety of adult learning options. With campuses in Worcester and Leicester, Mass., Becker College traces its history from the union of two Massachusetts educational institutions—one founded in 1784 and the other in 1887—and has over 22,000 alumni worldwide.